But history shows time and again just how fragile is our progress. The Pyramids, Library of Alexandria, Rome, Inca Empire, and many other apexes of civilization have come and gone in the tick-tock of a CPU clock cycle, leaving only ruins behind if they left anything at all. Civilization, born out of our altruism and ingenuity, is the trait that makes humans the most technologically-advanced and successful species in the Solar System. As an agent of the Future Forgers, you are a defender of Civilization. You are a self-improver, safe-guarding your health and well-being so as to best serve the greater good. You are a spreader of factual knowledge, challenging assumptions, and perpetually questioning the veracity of even the memes inhabiting your own head. You protect the sanctity of your habitat, both in the home and outdoors, knowing that a healthy environment provides for healthy humans with healthy minds that produce healthy ideas. You are both an agent of change and agent of preservation. 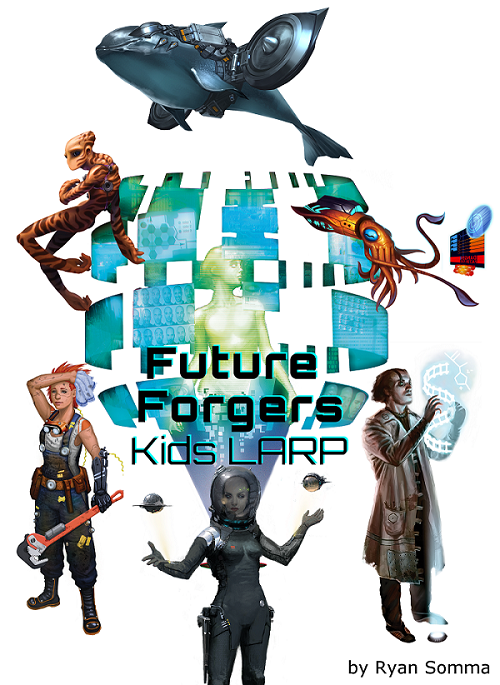 Posted here is an easy-going, yet structured Live Action Role Playing (LARP) game for kids and parents intended to highlight just how amazing and fantastical our modern lives are. It turns parenting into a kind of make-believe that has real-world positive outcomes for both parents and their children. It turns childhood into place where make-believe is encouraged because so much of the rules our civilization agrees upon are also consensual fabricated constructs. Posthuman Studios, authors of the amazing futuristic Eclipse Phase role playing games, have made the artwork in this book possible through their generous use of the Creative Commons BY-NC-SA 3.0 license. And I am very grateful to them.